I always enjoy traveling and getting to see new golf courses, but one of the drawbacks is having to lug my golf clubs through airports, rental car centers and hotel lobbies. Relying on rental clubs hasn’t always worked as some places just don’t have quality clubs. Well, I’ve got good news if you feel the same way. There’s now a first-class concierge-type service available..
CaddyX, a startup based in Kansas City, created an innovative logistic platform that takes away all the hassles, lugging and risk by making it easy for you to transport your golf bag from your home or office directly to a golf course, hotel, resort or any other address that you designate. The only time you really have to handle your clubs en route when using CaddyX is on the course. Imagine, having your golf bag picked up at your home or pro shop, and upon arriving to your destination, find your golf bag is on a golf cart ready for your tee time. After your final round, you leave your golf bag at the destination’s pro shop and walk away. I have to agree with CaddyX CEO Jason Gregory that CaddyX has created something extraordinary, a powerful easy-to-use logistics platform that will revolutionize golf travel worldwide. On recent trip to Atlantic City, a driver picked up my clubs at my condo in Garland, TX and they were at the hotel when I arrived. My CaddyX Concierge emailed me updates throughout the transport from pickup reminders to delivery notifications. Since I was playing multiple courses, I did have to handle my clubs to get them to the second course. On finishing a golf tournament on the final day of the conference, I left my golf bag at the course. They were picked up the next morning. Because of another trip on the weekend, I opted for one-day delivery (you pay a little more) and had them by 10 a.m. the next day. Your personally assigned CaddyX Concierge ensures you don’t have to lift a finger or worry about a thing. From pickup to delivery, they use the power of CaddyX’s innovative logistic platform to deliver you peace of mind every step of the way. Further, each transport includes a $500 on-time guarantee for rentals and incidentals as well as $5,000 of golf gear protection for lost or damaged golf gear. One of the other golfers at the conference found out about the on-time guarantee when her clubs did not arrive. They were later found, but it appeared that the fault was with the way a friend put the luggage tag on the travel cover back in Texas. In addition, when the travel cover was damaged, she got a new one as part of the guarantee. 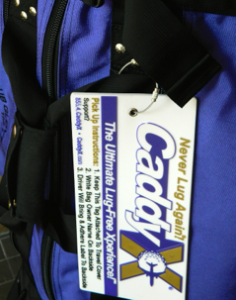 When comparing the other ways to take your clubs with you, from the airlines or do-it-yourself golf bag shippers, keep in mind that CaddyX offers the only all-inclusive 100% hassle-free, lug-free and risk-free golf bag transporter and delivers the best overall value. With CaddyX, you’ll never have to lift a finger or worry about a thing. To CaddyX your clubs, you first create an account at CaddyX.com. This instantly creates your virtual CaddyX locker and generates a golf bag profile for you to personalize, and even upload a photo of your golf bag if you like. You can create additional virtual golf bags for yourself, friends or family. Once your done personalizing and creating your golf bag(s), you’re ready to book your first lug-free golf trip by clicking the orange book now button. I think you will join me in liking the idea of waltzing through airports without having to lug your golf clubs.